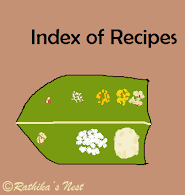 Thayir sertha kootu or aviyal is generally included in the traditional feast menu. This preparation goes well with sambar as well as rasam. * Chow-chow, ash gourd or plantain may be prepared in this manner. Method: Cover and cook cut vegetables with salt and little water in a kadai on a low flame. You need not add water if ash gourd is used as it will become watery when cooked (நீர்த்து விடும்). Grind coconut, jeera and green chillies into a fine paste. Once the vegetables are cooked, add the ground paste, mix well and bring it to boil. Now add curds and mix well. Switch off the fire. Heat coconut oil in a tadka pan (spice heating pan/தாளிக்கிற கரண்டி), add mustard seeds, when they start to sputter, add urad dhal and Bengal gram dhal, and fry till the dhals turn golden brown. Remove from fire. Add the seasonings to the kootu and garnish with curry leaves . Serve hot with rice and rasam/ kuzhambu. Note: You may add two tablespoon of pressure cooked whole green gram (பச்சை பயறு)/ black eyed peas (காராமணி), or boiled green peas (பச்சை பட்டாணி) to the kootu. This improves the taste as well the nutritional value of the kootu.